During a recent discussion about a photo of a juvenile accipiter, I had a thought. I was arguing that the bird was a Sharp-shinned Hawk, while someone else was insisting that it was a Cooper’s. I did not think the legs seemed overly bulky (probably a female Sharpie), while the other person thought the legs looked way too large to be a Sharp-shinned. Both of us cited the old adage, that Sharpies have little “pencil legs” while Cooper’s do not. Clearly, one or both of us had a skewed perspective. Now, with my history as a bander I’m a bit disappointed that I hadn't thought about this before, but it came to me now: I have seen enough tiny male Sharpie legs to know that their legs are actually much thinner than a pencil. But how much thinner? And how much thicker than a pencil are a Coop’s legs? 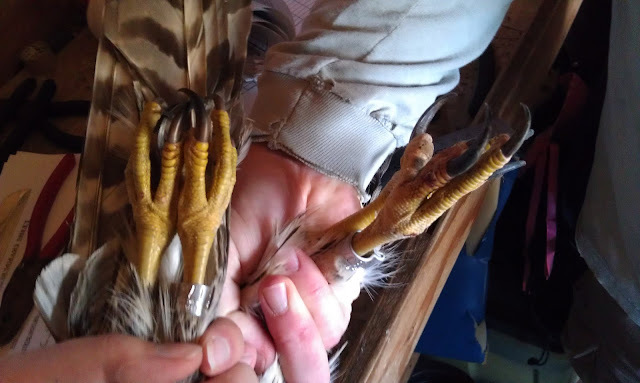 In my mind’s eye I tried to picture the last female Cooper’s Hawk that I banded…..Her legs were probably about as fat as my pinky finger, right? Well, that just wouldn't do. I went and dug out my banding kit and found what I was looking for….the all powerful Band Gauge! For those who are not ornithologists, let me explain. For many species of songbirds there is a particular band size that fits each particular species, without much variation. For example: Ruby-crowned Kinglets take a 0A band, White-crowned Sparrows take a 1B band, American Robins take a size 2. But for Raptors it’s different. Not only is there a wide range of variation between the sexes in many species, but there is also variation between individuals. So, when banding raptors, you must always measure their leg to make sure you choose the right band size to fit. You don’t want it to be tight and rub on the scales, and you don’t want it to be loose and jangle around. I always tell kids who visit that the band gauge is like those metal things in the shoe store they use to find out your size! So I got out the gauge and started digging through drawers, trying to find things that fit for each band size for Sharp-shinned and Cooper’s Hawks. I was honestly surprised at how much my memory had inflated the size of their legs! I suppose that much of this has to do with the fact that at the end of their legs are some very sharp and intimidating talons! Well, maybe not so much for the male Sharpie, but the hallux of an angry female Coop is nothing to laugh at! --I chose items that fit snugly in each spot. No wiggle room. --Bird legs for each band size are a tad smaller than the objects that fit in the slots, since bands are not skin-tight. 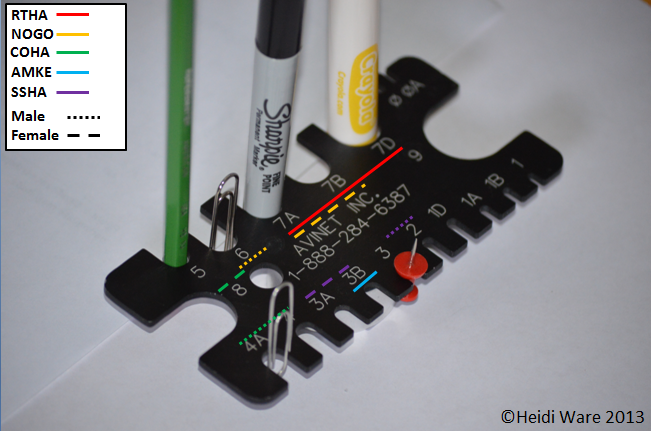 --The paperclip up front (band size 4A) is a standard small paperclip. Only the skinny end fits in the gauge. The pencil fits in 4A, but can't spin because of the corners and straight edges. --The paperclip in the back (band size 6) is a standard large-size paperclip. --The center of the thumb tack cannot fit in the size 2 slot. As you may have noticed, the bird with the pencil legs is actually a female Cooper's Hawk! Finally, in case you don't believe me, a few photos of “real life” raptor legs. 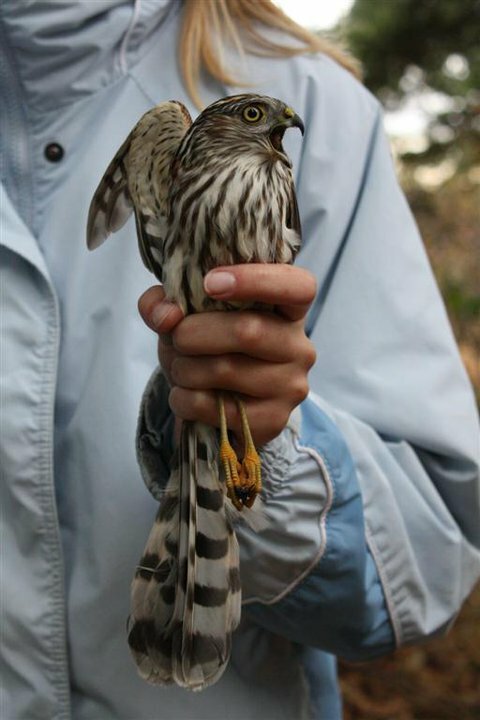 A juvenile male Sharp-shinned Hawk caught in the Idaho Bird Observatory's songbird nets. Photo by Lisa Huttinger. 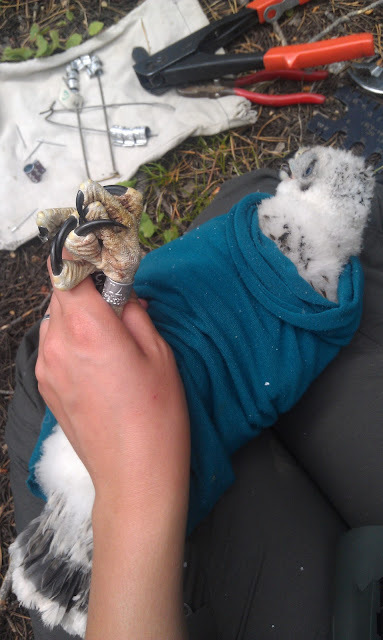 I know....somehow after five years at the Idaho Bird Observatory I have never taken a photo of Cooper's Hawk talons! Nice article Heidi. You just may become famous! hehe the look on that Sharpie's face is priceless!